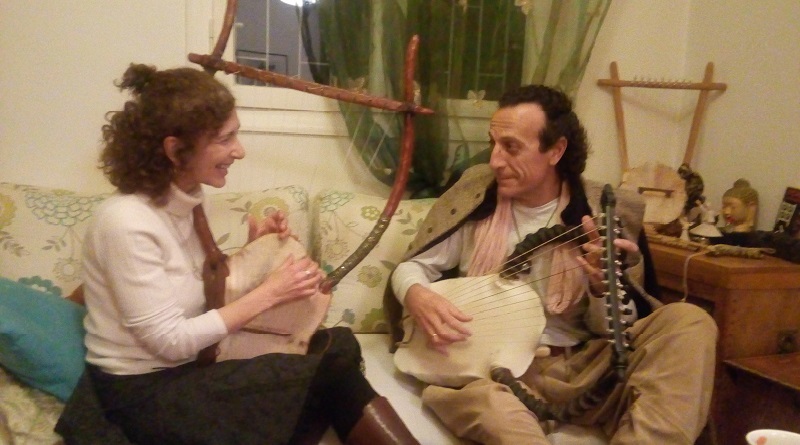 Spanish composer Luis Paniagua and Greek musician Aliki Markantonatou are sharing their passion for the Greek, ancient lyre and they will meet on stage this Friday, Januyary 15th at the “Proskinio” theatre in central Athens. They are two of the very few musicians around the world who perform, record and innovate the lyre techniques and sound. Luis comes from Spain and it is his fourth trip to Greece. In 1984 he permormed at the Herod Atticus Theatre, while last summer he visited Corfu in the Ionian islands to participate in the “Sound & Silence Festival”. His first contact with the lyre was in 1974, as a member of the “Atrium Musicae” in Madrid, leaded by his brother Gregorio Paniagua. They recorded the first ever album of fragments of ancient Greek melodies, entitled “Music of Ancient Greece”, released by French record label, Harmonia Mudi. In 1980 I went to India to study classical, Indian music and when I returned to Spain I started composing and playing my own music. I was experimenting with many music instruments from all over the world. From 2000 onwards I was devoted to the lyre and started composing music for lyre and singing”. He has recorded 16 albums. He is also the winner of The World Music Torchbearer Award (2012). His album “Nanas de Sol” won the National Award for the Best Album of the year 2002, by the Academy of Arts and Science of Music of Spain and he was one of the nominees for his album “Bienvenida” in 2003 for the same award. He has performed in many cities in Europe, America and Asia. She soon started performing, combining the lyre with many instruments such as sitar, cretan lyre, lyre of the Black Sea, wooden flutes, sax etc. In 2013 she recorded the CD “Awakening of the Muse” with the Lyre ‘n’ Rhapsody band. Two more CDs came with the same band, including compositions of all members. One of them is a unique collaboration with world awarded Chinese musicians, Chang Jing (guzheng) and Zhang Di (Chinese flute). She has traveled in Turkey, India and Paris, performing with her lyre and combining it with traditional instruments. Her efforts are towards bringing the lyre into life and placing it among the cultural heritage elements of her country. “Lyre carries high aesthetics and the power to transform and connect people with the silent and peaceful part of themselves”, she says. Luis Paniagua and Aliki Markantonatou will perform their own compositions, songs in ancient and modern Greek language and improvisations, on Friday 15 January at the “Proskinio” theater, on 8, Kapnokoptiriou & Stournari streets in central Athens. Irene Anastasiou an excellent cellist will be their guest, along with Loukia Konstantatou in the kanun and Chrysostomos Boukalis, a contrabass player. Flamenco choreographer Yiota Peklari will dance. Luis Paniagua will also give a solo concert on Saturday January 16th and a workshop on Sunday January 17th at the “Playground for the arts” (4-6, Voutsara street , Votanikos Tel: 210 85 44 836).